ST. GEORGE – A proposed exchange of land in the Red Cliffs Desert Reserve for land in the Sand Mountain area was given a nod by the Habitat Conservation Plan Advisory Committee Tuesday. The exchange could potentially resolve the longstanding issue of compensating landowners for land taken by the creation of the desert reserve over 20 years ago. 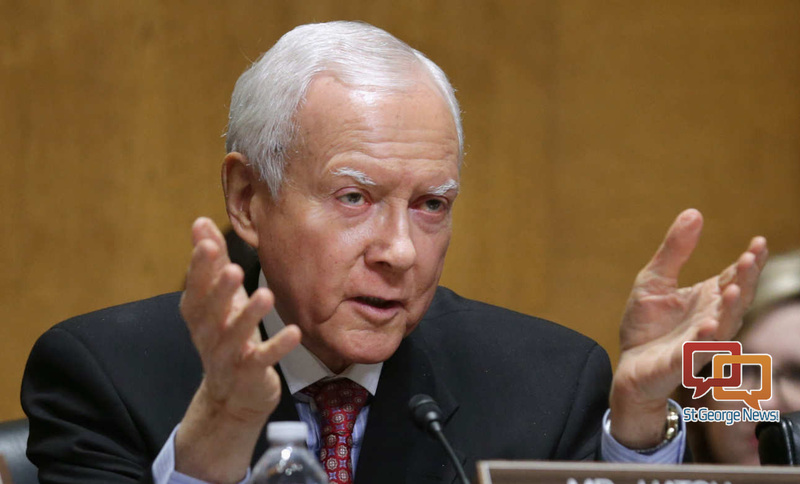 The proposal is not without opposition, however, as the Utah Public Lands Alliance, an outdoor recreation advocacy group, has threatened to block the land exchange through any legal way they can, including possible litigation. The Red Cliffs Desert Reserve was created in 1996 to protect the endangered Mojave desert tortoise and other species while allowing development to continue in the rest of Washington County. 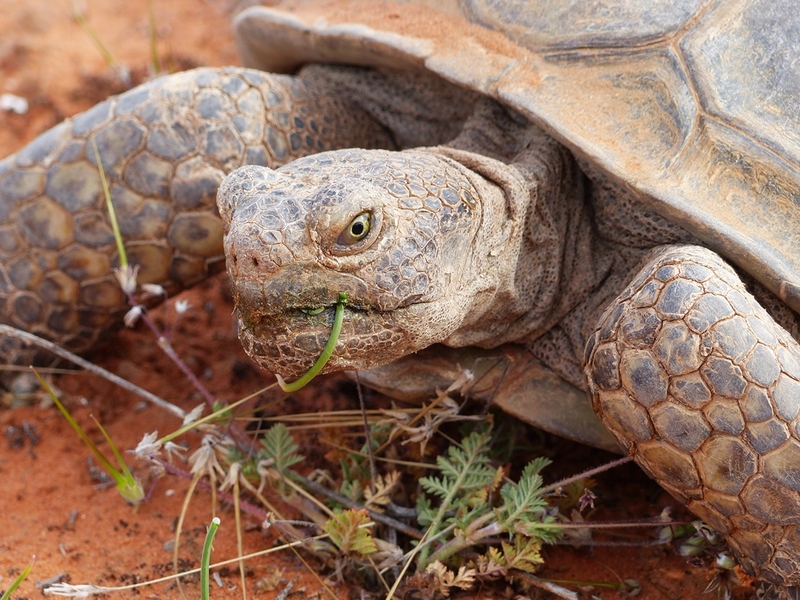 The Habitat Conservation Plan, the managing document for the reserve, set aside the 62,000-acre reserve thereby allowing continued development in otherwise tortoise habitat in the rest of the county. A handful of private landowners and the School and Institutional Trust Land Administration, or SITLA, still own land within the reserve. Under the terms of the Habitat Conservation Plan, these remaining properties must either be purchased outright or traded for land of equal value. Out of over 1,000 acres of private property left in the reserve (not counting SILTA-owned land), developer Bob Brennan is the largest of the landowners with 662 acres. Earlier this year, Brennan exchanged land within the reserve for 600 acres in the Long Valley area. In September, Brennan approached the HCP advisory committee with another proposed land swap that could help alleviate the ongoing issues within the desert reserve. The Sand Mountain Special Recreation Management Area near Hurricane contains varied terrain including both sand dunes and rock formations used for rock crawling. Recreationists use motorcycles, all-terrain vehicles, side-by-sides and full-sized four-wheel drive vehicles in the area. It is estimated recreational activities at Sand Mountain brings in over $3 million to the local economy annually. The proposal proposal involves both an exchange and a donation. Two hundred acres of Brennan’s land in the reserve, 30 percent of it, would be exchanged for nearly 700 acres in the Sand Mountain area southeast of the Sand Hollow reservoir. The remaining 462 acres of his land, 70 percent of it, would be donated by him to the desert reserve. The 462-acre donation represents tens of millions of dollars worth of property. Two other parcels of land – another 200-acre piece southwest of the reservoir, as well as another 40-acre parcel – were included in Brennan’s original exchange proposal. 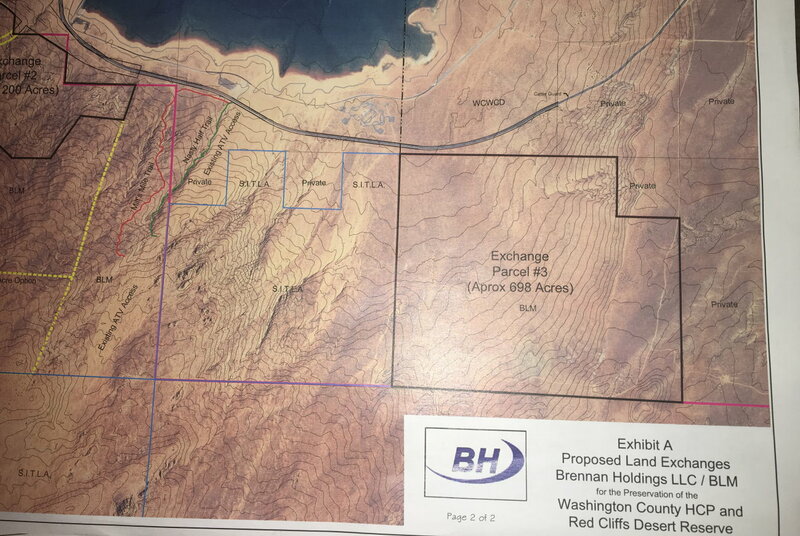 Jim Raines, who has represented Brennan Holdings at previous HCP meetings, said Wednesday that Brennan’s acquisition of the second 200-acre piece as part of the exchange has since been removed from the proposal. The second 200-acre parcel was originally a part of a 1,200-acre area Brennan wanted that has since been shrunk and ultimately taken off the table. Raines said it was dropped due to the negative impact Brennan’s acquisition could have on off-highway vehicle use in that part of Sand Mountain. Brennan isn’t asking for a straight acre-for-acre trade, Raines said at the September meeting, but rather an exchange equal to the value of the 200 acres in the reserve that Brennan wants to sell. The value of an acre in the reserve is ] around $100,000, he said. Lingering issues of privately-owned land within the reserve have been one of the factors holding up renewal of the HCP (another being the proposed northern corridor). The HCP expired in 2015 but the U.S. Fish and Wildlife Service has allowed it to continue functioning for the time being as efforts are made to renew the plan. If the land exchange goes through, Brennan said, he, along with two other developers he has been working with who have property stuck in the reserve, will sign off giving their support to the HCP renewal. “There are a lot of other issues involved (in the HCP renewal), but this would make it a lot easier,” said Larry Crist, of the U.S. Fish and Wildlife Service. Crist sits on the HCP advisory committee along with a representative of the Bureau of Land Management and other parties with interest in the desert reserve. Washington County Commissioner Dean Cox, who attended the meeting, said the commission typically shows deference to the HCP’s decisions. The commission itself has a legal role to play as the facilitating party between the federal agencies overseeing the desert reserve and private parties, he said. While the committee gave verbal approval toward the plan in September, it solidified that support with a unanimous vote Tuesday. Hurricane City Mayor John Bramall, who represents the Washington County Mayors Association on the committee, said the Hurricane City Council had previously voted 3-2 to consider supporting the proposed land exchange if certain conditions are met. According to the Brennan Holdings proposal, the Sand Mountain exchange property would be annexed into Hurricane City, which would then provide zoning for the property. 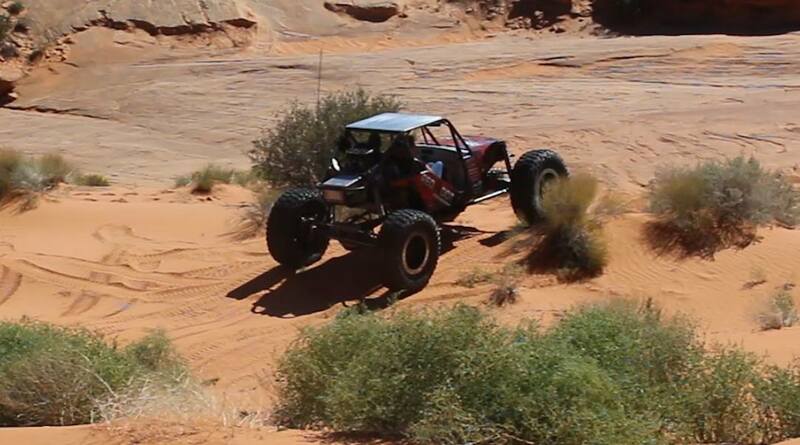 Among the Hurricane City Council’s conditions were questions of allowing all-terrain vehicle and OHV access to continue in the segments of Sand Mountain that Brennan is asking for. 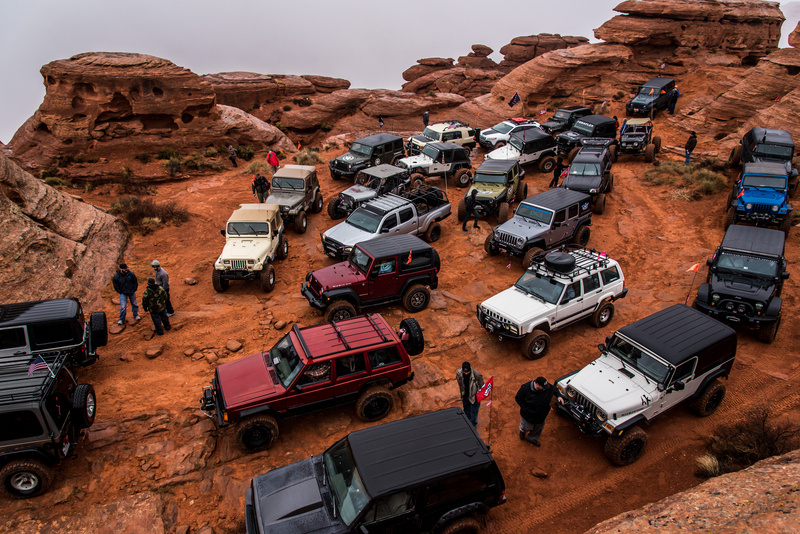 It is a concern shared by the Utah Public Lands Alliance, a group that seeks to preserve the area of Sand Mountain as a recreational site for off-road vehicle use in perpetuity. The Sand Mountain area has been designated as an OHV recreational site, yet is subject to having bits and pieces chipped away for other uses by the BLM. The area was once 22,000 acres in size, and is now 18,000 acres. 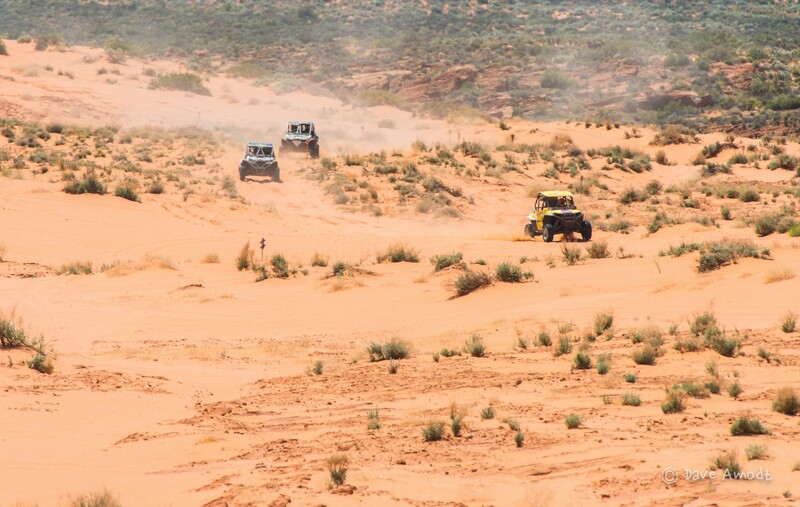 Sand Mountain recreational use – primarily OHV and other off-road activities held throughout the year – is estimated to bring over $3 million annually to the local economy, Gil Meacham, UPLA’s president, said. It draws over 200,000 visitors annually. Companies that profit from Sand Mountain’s recreational use are planning to expand operations, Meacham said, and allowing a development to come in – even one of just 700 acres – will disrupt that. Moreover, there is the additional fear that if the exchange happens and homes are built, residents on the new development will complain so much about disruptions and noise caused by off-roading activities that the point will come they’ll demand such activities be limited or shut down. In the September meeting, Raines said that Brennan has no intention to disrupt activities on Sand Mountain, as it is those very activities that make the land valuable in the first place. They believe in maintaining the open space and open access and not doing anything to harm the value of the site, he said. Still, the UPLA group is not convinced and is pushing back against the exchange and vows to continue pushing, even to the point of litigation. “We’ll use every means available to fight this,” Meacham said. Another concern for both the Hurricane City Council and UPLA is SITLA. 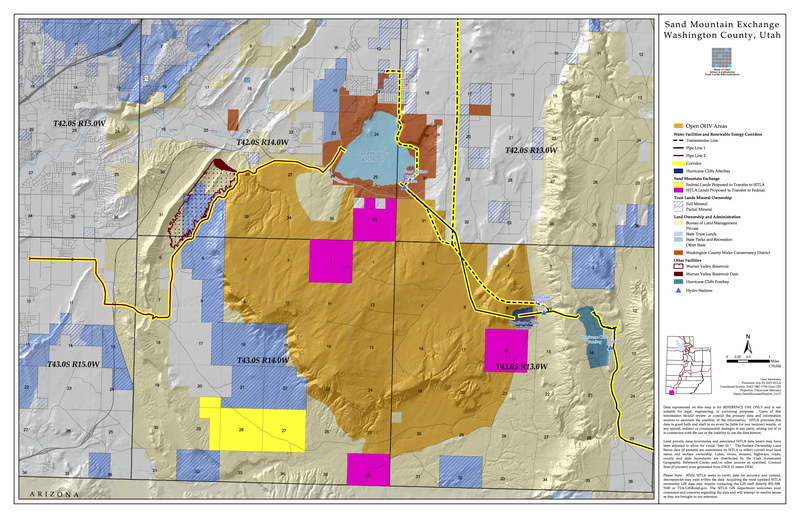 The trust land administration, a state agency, owns land in and around Sand Mountain and its primary goal and mandate is to use the lands it owns for the benefit of Utah’s public school students. If SITLA officials feel the best use of a piece of land is to sell it for development, then that is the direction they will go. That is what has Hurricane City officials and UPLA worried. “We’re radically opposed to SITLA developing Sand Mountain,” Bramall said. For the moment, SITLA sees off-road recreation as the best use of the property it has on Sand Mountain, said Kyle Pasley, SITLA’s deputy assistant director. While SITLA does sell land for development, Pasley said, it also draws revenue from lands used for recreation, mining and other uses. While there currently do not appear to be any plans to sell the land – some of which is location in the heart of Sand Mountain – event organizers must nonetheless pay for permits allowing them to use the land. The Hurricane City Council and UPLA want SITLA to allow the land to be used for recreational activities in perpetuity, something that Pasley said they can’t do. If a better use for the land is determined in the future, SITLA is mandated to pursue it to the maximum benefit of the state’s public schools. There is currently legislation slowly working its way through Congress that may be able to resolve the SITLA issue. The bill would transfer Sand Mountain’s 18,000 acres to management by Washington County. The bill would also help quell fears over SITLA land, as those lands would be traded out with “more suitable lands,” Pasley said. UPLA supports the bill with some reservations, Meacham said, as they don’t know what county-level management of Sand Mountain would entail. Still, he said, it’s a better alternative than losing the land a little bit at a time. While the bill pushes for transfer of land management from federal to county agency, it does not address or resolve pending land exchange issues concerning Sand Mountain. Former St. George News reporter Julie Applegate contributed to this report.